Each week I boldly delve into a bag of ten random comic books, choosing one (and only one) panel from each to get the raw materials for crafting a comics story requiring no illustration ability whatsoever on my part. Just the power to make bad puns. Recent press reports of a monster-sized boy reach wealthy super-spy Colonel John Fortune. Something about the description in the reports, the timing of the appearance, or some other imperceptible clue drives Fortune to eventually set up a clandestine e-mail correspondence with the "monster boy", resulting in a heart-wrenching confessional. 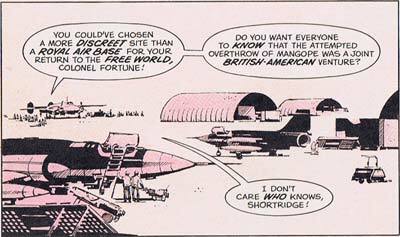 Fifteen years earlier, the lad writes, his story began with the theft of an Avengers Quinjet by none other than Colonel John Fortune! The jet winged over the Pacific, headed to a secret British-American air base, despite the trepidation of the very young, and very pregnant, woman accompanying the Colonel. CIA Special Agent In Charge Shortridge, commander of the secret base, grew livid at Fortune's unauthorized intrusion, which threatened to upset years of careful planning. Keeping the young woman and her unborn child away from the always-dangerous clutches of over-powered government super-groups and ultra-secretive multinational military cabals was all that Fortune cared about, but for once he'd stepped on too many toes. Fortune was thrown clear of the explosion, but he never found the young woman, flung by the hand of fate into the arms of a kindly vicar who lived nearby. When it became clear just how much danger the young woman represented, the vicar's first impulse was to turn her in, an impulse quickly squashed by his outraged wife. "The young woman died in childbirth a few short days later," Colonel Fortune tells his servant tiredly after setting the emailed missive down, "and the vicar raised the lad for fifteen years, but you know what the big problem is?" Tune in next week* to learn the heartbreaking secret of the relationship between Fortune and the Monster Lad, a secret that threatens to disAssemble the Avengers! "Green Arrow Annual", No. 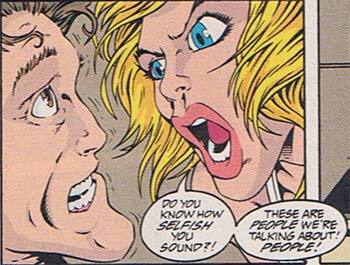 1, ©1988, DC Comics Inc.
"Scare Tactics", No. 4, ©1997, DC Comics. "West Coast Avengers", Vol. 2, No. 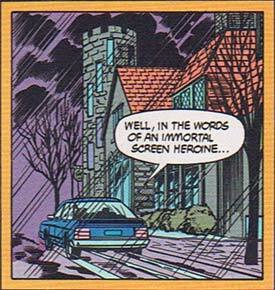 47, ©1989, Marvel Comics. "West Coast Avengers", Vol. 2, No. 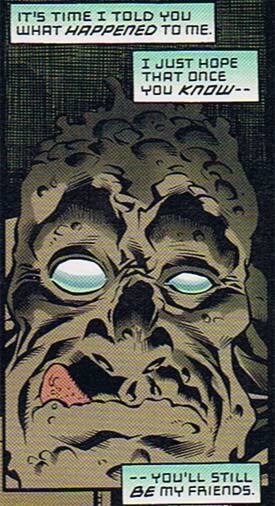 46, ©1989, Marvel Comics. Featuring the first appearance of the Great Lakes Avengers! "Bold Adventure", Vol. 1, No. 2, ©1984, Bill Dubay. "The Batman Adventures: The Lost Years", Book 1, ©1998, DC Comics. "Cloak and Dagger", Vol. 1, No. 6, ©1989, Marvel Comics. "Aquaman", No. 30, ©1997, DC Comics. "Green Arrow", No. 7, ©1988, DC Comics, Inc.
"Void Indigo", Vol. 1, No. 2, ©1985, Steve Gerber and Val Mayerik.